Megan Nielsen design sewing patterns with real people in mind and she's passionate about sewing beautiful clothing that you can wear every day. 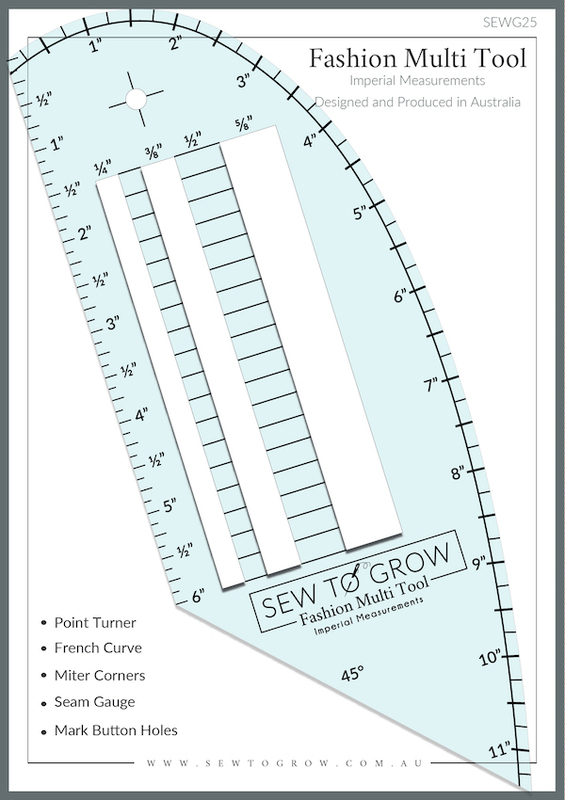 Meg's goal is to make sewing your own stylish wardrobe enjoyable and easy. Easily adaptable modern shirt dress. Pattern features deep v-neck, button front, high waistline, multiple sleeve lengths, large pockets and ties at the back to allow it to be worn in a fitted or loose style.Version 1 includes waist darts and a gathered skirt. Version 2 is a dartless blouse, and Version 3 is a dartless dress or tunic. 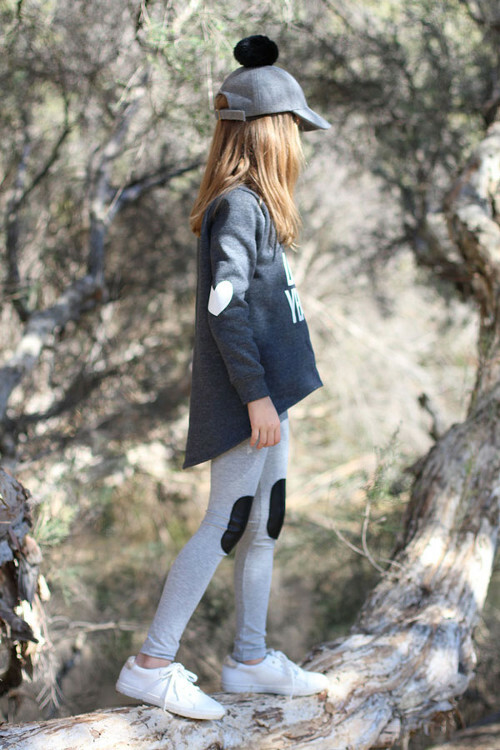 River is a reversible raglan dress or top that can be made in woven or knit fabrics. Pattern features loose fit, optional pockets and waist tie, as well as top and dress options. It can be worn with the V neck or the round neck side at the front. Modern take on culottes combining the practicality of shorts with the appearance of a skirt. 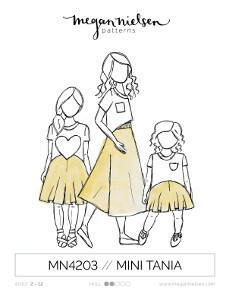 Pattern features a fitted waistband, wonderful drape, invisible side seam zipper and hidden centre front and back pleats to create the illusion of a skirt.Version 1 is mini length, Version 2 is knee length and Version 3 is midi length . Gathered skirt with deep scoop pockets. Pattern features exposed zipper and contoured waistband sitting on the natural waistline.Version 1 is above the knee and includes pockets. Version 2 is midi length, includes pockets and additional fullness. Version 3 is basic knee length gathered skirt. Stylish and comfortable shorts or pleated skort. Pattern sits just below the natural waistline, features a modern fit, two lengths and a full lining. Version 1 is a pair of shorts with curved patch pockets. Version 2 is a mid length pleated skort with slash pockets which combines the comfort of shorts with the appearance of a skirt. 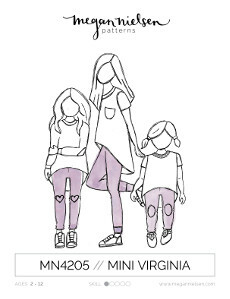 Ash is the ultimate stretch jean pattern set. 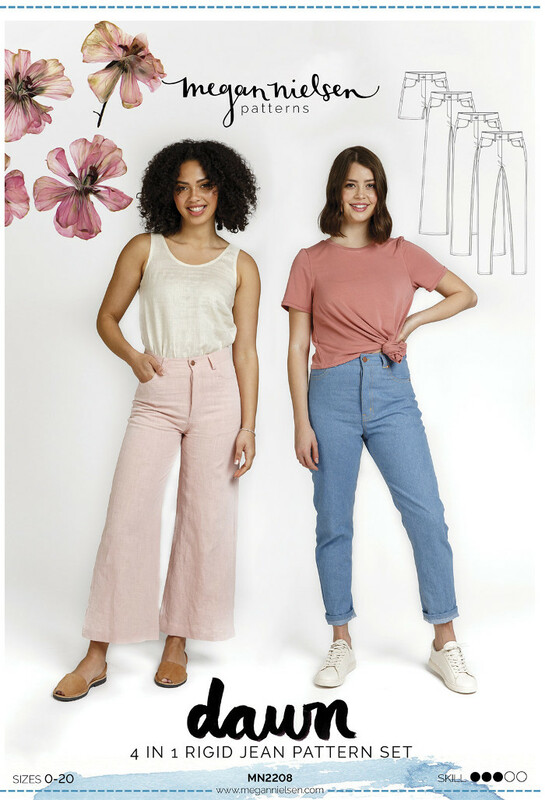 Sewers won’t need to buy multiple jeans patterns, this pattern includes every option imaginable with four cuts and multiple lengths for tall, regular and cropped. 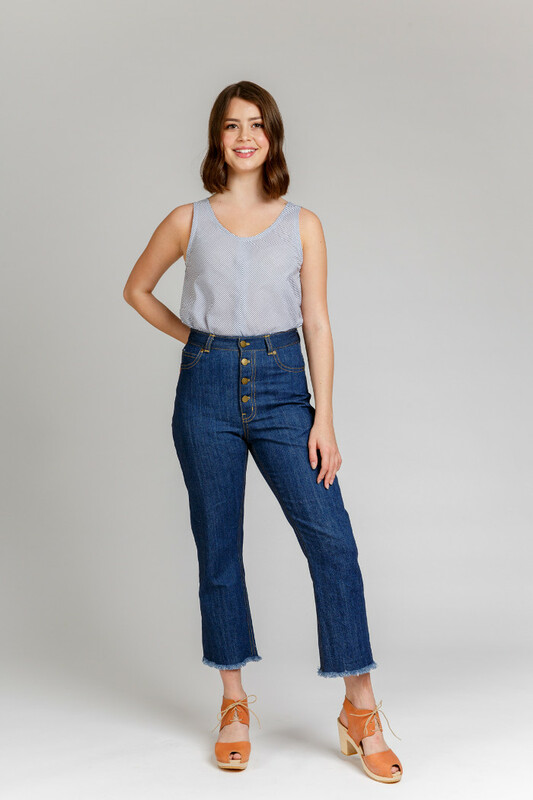 The pattern features a comfortable rise, close fit through the waist and hips and classic jeans details. 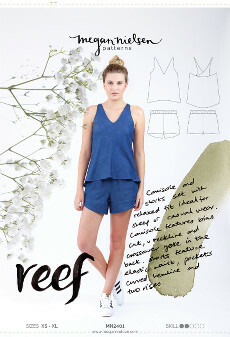 Made from light weight fabric, Reef is a super cute camisole and shorts set that is perfect for either sleep or casual wear. The top has a bias cut, v-neck and really striking cross-over yoke in the back. 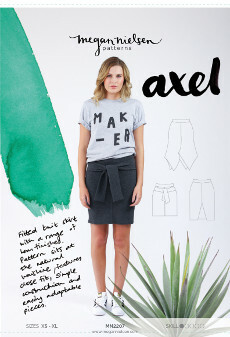 While the shorts have an elasticated waist, pockets, optional curved hem-line and the choice of two rises. Modern take on culottes combining the practicality of shorts with the appearance of a skirt. Pattern features three variations, an elastic waistband, wonderful drape, and hidden centre front and back pleats to create the illusion of a skirt. 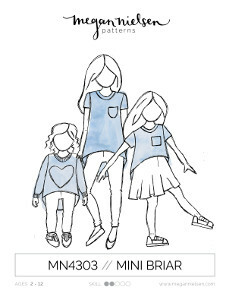 Version 1 is shorts length, Version 2 is knee length and Version 3 is midi length.